Native and feral animals: the species present and their havens. Use a self-assessment tool (SAT) to audit your farm’s financial, social and environmental sustainability. Tool 5.11 lists a number of SATs which are general enough for any sheep producer to use. Use tool 6.1 in Healthy Soils to assess and record the land classes across your farm. From your knowledge of the farm and the land classes, identify the key areas at risk of soil erosion and record them on your aerial photo. Gully erosion is most common in higher rainfall zones. Gullies produce poor quality run-off and, with streambank erosion, are the main sediment sources across southern Australia. Maintaining and/or increasing groundcover can prevent and/or reduce the impact of these erosion processes. Set goals for groundcover in each land class on your farm using the benchmarks in procedure 6.2 in Healthy Soils. Use tools 6.2 and 6.3 in Healthy Soils to measure groundcover at the sites with highest erosion risk on your property. The primary cause of dryland salinity in Australia has been the replacement of deep rooted/perennial native vegetation with shallow rooted/annual crops and pastures that use less water. A 1,000ha farm receiving 500mm of rainfall has 5,000 megalitres of water to manage each year. Poor management of the water cycle (see figure 5.1) directly impacts on many of our resource management issues, including soil erosion, high nutrient loads in rivers, soil acidity and dryland salinity. If areas are salty, tool 5.1 will help rate salinity across your paddocks. SALTdeck cards (see tool 5.10) will help you identify the indicator species listed in tool 5.1. Water draining through the soil leaches nitrogen and contributes to soil acidity. Perennial pastures can assist in preventing soils becoming more acid. Productive pastures, profitable grazing systems and improved sustainability are all about efficient management of the water cycle. It is important to identify what native species are present on your property to inform future management actions. Native pastures provide reliable (because of their diversity) and low input production while helping to maintain healthy soils and ecosystems. Much of Australia’s fine wool comes from native pastures because they provide a persistent, consistent feed supply. Native grasses are more persistent when allowed to recover after grazing, so that rotational grazing/resting for at least part of the year is an advantage. Native pastures respond positively to low rates of fertiliser, but higher rates destabilise the pasture, with annuals and weeds crowding out native perennials, though this can be mitigated by grazing management to some degree. Species identification tools are not included in this package but tool 5.10 contain many useful references and links. Most regional NRM authorities (see signposts) have tools, access to local experts and information to help sheep producers identify native species. Several assessment and monitoring tools are listed in tool 5.10. Use one of these tools to quickly and simply assess the condition of native bush, riparian zones and native pastures on your farm and for on-going monitoring. Discuss and record what you would like to see in your areas of native bush, riparian vegetation and native pastures, what changes could be made to protect areas at risk (eg, make them larger, denser, more diverse, etc), and when you will address these risks. Birds are placed well towards the top of food chains - an ibis can eat 250 grasshoppers/day and a magpie can eat 40 scarab beetle larvae/day. A diverse range of bird species inhabiting the ground, the understorey layers and mature trees indicates the remnant vegetation is healthy. Native birds are perhaps the most useful ‘indicator’ group. A farm with a rich diversity of birds will also have a relatively high diversity of trees, shrubs, mammals, reptiles, frogs and invertebrates. If the small birds are missing, there is something wrong with the habitat. Too many larger birds or noisy miners indicate a lack of balance. Use Quickchecks (see signposts) to assess bird numbers and diversity on your property. The tool accounts for the fact that different parts of the farm will have different bird groups, highlighting the fact that a variety of habitats is required across the farm. Alternatively, keep a small notebook in the ute and record birds (and/or native animals) as you come across them in your ordinary day’s work. All family members can make entries in the notebook and later add them to a master list. Tool 5.10 lists many useful references and links to help you identify birds. Identify changes you can make to the vegetation on your farm to improve bird populations, and when you will make them. Pests and weeds threaten both pasture productivity and natural resources. The threat posed to biodiversity by weeds is ranked second only after land clearing. Successful weed management is much more than ad hoc weed control. It is important to work out why weeds are a problem on your property; set realistic goals for both pasture and weed management; undertake the appropriate weed management practices on time, every time; check whether your weed management has been successful and adapt your plan as needed. This approach of Deliberation, Diversity and Diligence is called the ‘3Ds of Weed Management’. Each step has key decisions and critical actions. Use the Deliberation table in tool 5.3 to compare a stocktake of your current weed problems (species and density in key paddocks) and agree on priorities for action based on what you want the weed level to be. Record what changes could be made to weed populations on your farm by when. Invertebrate pests, including insects and mites, can significantly reduce pasture productivity throughout the year. Across Australia, Red-legged earthmite (RLEM) infest 20million ha of pasture, causing $200million damage to the wool industry alone. The first step on the farm is to correctly identify the pest. Your local agronomist can help you identify the species present. Other sources of information include CSIRO Entomology (see tool 5.10) and State Departments of Primary Industries/ Agriculture. Identify what you would like the pest level to be, and what changes could be made to reduce and keep pest populations small. It is important to choose the appropriate tools to manage each pest, using an integrated approach (integrated pest management or IPM – see procedure 5.3) and to monitor the effectiveness of your approach. Different pests require different management strategies. For example, redlegged earthmite (RLEM) and blue oat mite (BOM) look very similar but have different lifecycles. This difference means that the timing of pesticide spraying using TIMERITE® (see signposts in Procedure 5.3) works for RLEM, but not for BOM. Native browsers such as kangaroos, wallabies and wombats. Many of the habitats that support native animals and birds on farm also favour the vertebrate pests. Individual sheep producers and their families have to find the balance that suits their situation. Rabbits damage vegetation by ringbarking trees and shrubs; prevent regeneration by eating seeds and seedlings; and degrade the land through burrowing and reducing groundcover. Selective grazing by rabbits changes the composition of the vegetation. Where rabbits have caused the slow decline of, say, bulokes on roadsides in western Victoria, there are fewer food trees for species such as the red-tailed black cockatoo that have declined as a result, though clearly not from direct ‘competition’ from the rabbits. The impact of rabbits often increases during and immediately after drought and/or fire, when food is scarce and they eat whatever remains or re-grows. 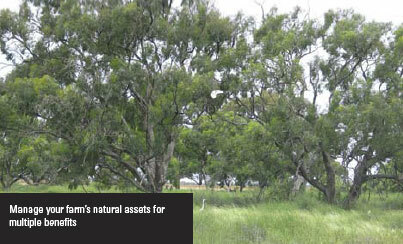 2-3 rabbits/ha is sufficient to severely depress the regeneration of native shrubs and trees. Spotlight transect counts (the number of rabbits seen along a set route or transect) are an accurate way to monitor rabbit populations, though the number of rabbits seen in the car headlights when driving home provides a good enough indicator of rising or falling rabbit numbers. Fox control can increase lamb marking percentages by as much as 25% when programs are implemented. In addition, foxes are major predators of rabbits (good) and small native mammals and reptiles (not good). While monitoring rabbit numbers is useful on farm, monitoring fox numbers is not. This is because of the highly variable (and imprecise) relationship between predator numbers and their impacts on prey species, and because with sheep, it is only at lambing that predation is likely. Identify the prevalence of vertebrate pests and their location on your farm, what you would like the pest level to be and what changes could be made to reduce and keep numbers down. The majority of Australia’s livestock drink from water that falls on the property. A variety of measures can improve water use efficiency in sheep grazing systems, including creating additional watering points and maintaining healthy soils to minimise run off. Healthy soil drives higher pasture productivity and benefits the environment through greater use of water and nutrients in the paddock and less risk of run-off, erosion and deep drainage (see procedure 6.4 in Healthy Soils). Like a feed budget (see tool 8.4 in Turn Pasture into Product), tool 5.2 will allow you to calculate how much water you have, how much your stock need, and/or how long a dam or water supply will last. Use tool 5.2 to complete a stock water audit of the quantity, quality and reliability of your stock water supplies. A life-cycle analysis of water use in red meat production found that it takes 103 - 540 litres of water to produce a kilogram of red meat. This is in stark contrast to 50,000 litres per kg meat often quoted (See: Red meat in the Australian Environment). The Earth’s surface temperature depends on the balance between incoming and outgoing radiation. The main greenhouse gases - water vapour, carbon dioxide (CO2), methane, nitrous oxide and ozone - absorb and re-radiate much of the infrared radiation released by the Earth’s surface. All of these gases occur naturally. They produce a natural greenhouse effect, maintaining the temperature of the Earth’s surface some 33°C warmer than it would otherwise be. Together, they make up less than 1% of the atmosphere, which is comprised mainly of nitrogen and oxygen. Between 1750 and 2005, methane concentrations rose by nearly 150% and nitrous oxide by 18% (IPCC, 2007). However, atmospheric methane concentrations have remained relatively stable since 2000, despite significant increases in livestock numbers globally. Australia’s livestock industry (including dairy) produces 10.2% of Australia’s total greenhouse gas (GHG) emissions. Most of these emissions are methane from the natural digestion process of cattle and sheep. Energy generation represents 37% of Australia’s greenhouse gas emissions. Australian sheep producers have always dealt with a variable climate and its associated droughts and floods. Climate change scenarios suggest this variability will increase. For example, farm input costs like electricity, fuel and fertiliser will rise when a carbon tax is introduced in Australia. Increased heat stress associated with climate change could reduce the reproductive performance of sheep in areas where temperature and humidity increases. Vegetable fault and dust contamination in wool could increase where pasture composition changes, particularly if weeds and bare ground increase. Sheep producers now face not only the continued challenge of managing production of food and fibre, given the variability in climatic conditions, but the new challenges created by the community’s desire to see reductions in carbon emissions. A life cycle assessment of sheep meat production in a southern Australian production system measured total emissions of 78 kg CO2 per kilogram carcase weight. Wool has excellent ‘natural’ credentials - it is a renewable, biodegradable protein, and more than 99% is produced in extensive grassland terrain. Use the FarmGAS Calculator (see signposts) to estimate your farm’s annual GHG emissions, both at the individual enterprise activity level and for your farm as a whole, and to examine the financial impacts that different greenhouse mitigation options may have on farm business profitability. Greenhouse Gas Emissions and the Australian Red Meat Industry: a report commissioned by MLA on greenhouse gas emissions and possible abatement actions. Download here. The Australian Wool Innovation website has information and case studies relevant to wool growers on a range of natural resource management issues. Visit www.wool.com and click on On-Farm Research & Development > Production Systems and Eco Credentials > Environment and select Biodiversity, Water or Land. Regional NRM Authorities: critical links for natural resource management and funding – for access to all regional NRM Authorities across Australia go to www.nrm.gov.au/regional/regional-nrm-organisations and click on your region. The PestSmart Toolkit (www.pestsmart.org.au/) provides information and guidance on best-practice invasive animal management on several key vertebrate pest species including rabbits, wild dogs, foxes and feral pigs. Information is provided as fact sheets, case-studies, technical manuals and research reports. Also, view the PestSmart YouTube Channel (www.youtube.com/PestSmart/) for video clips on best practice control methods for pest animal management. Climate Change Information: Visit: www.mla.com.au and search for "Communicating Climate Change" for a range of publications. Weed ID; The ute Guide. Produced by GRDC. Available for iOS and Android. Designed to assist in the identification of most common weeds found in paddocks throughout Australia. FeralScan (https://www.feralscan.org.au/) is a community website and Smartphone App that allows you to map sightings of pest animals and record the problems they are causing in your local area. FeralScan can be used by farmers, community groups, pest controllers, local government, catchment groups and individuals managing pest animals and their impacts. Available for iOS and Android.